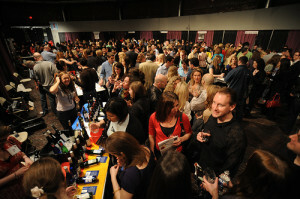 What could be better than an event with hundreds of wines waiting to be sampled? How about an event with hundreds of wines, plus a DJ, a photo booth, a lounge, food pairings, and free crash courses on wine? When the Second Glass hosts Wine Riot, its second snob-free wine tasting extravaganza, September 25 and 26, Rioters will swirl, sniff and sip some of the 250 wines from around the world. They’ll also get to pose for silly wine-themed photos in the photo booth, score free schwag, and learn more about wine regions and trends during crash courses. I attended the festivities last April, and it was pretty rad. If I’d had an iPhone (instead, I carry a BlackBerry) I would have been able to use their wine iPhone app to keep track of my tastings, which goes to show what an über-modern, “not your parents’ wine event” it is. A good time regardless. The Second Glass also hosts more intimate tasting events (called Crash Courses) at venues around the city, and I wrote up my experiences at the Wine Cocktail Crash Course last spring. The first Wine Riot sold out, so be sure to buy your tickets in advance if you plan on attending. Did you go to Wine Riot last spring? Planning to attend this time? Leave a comment and let us know! A contributing writer/blogger for DirectoryofBoston.com, Susan Johnston lives and writes near Fenway Park. She loves exploring the city and has also contributed to The Boston Globe, DailyCandy.com, and many other places.